RWY 13/31 has varying terrain heights from -5' to +12' along the full length of rwy inside of primary surface. OBSTRUCTIONS: Antelope, deer & elk in vicinity; mountainous terrain surrounds airport. Need a home for your airplane? Hangar lots are available. Click here for more information. 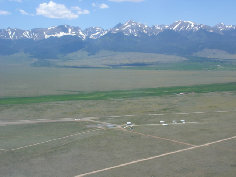 SilverWest Airport lays 8 nm southeast of Westcliffe in the middle of a 20 mile wide valley that is bordered on the east by the Wet Mountains, with peaks approaching 12,000 feet, and on the west by the spectacular Sangre de Cristo Mountains, the longest and straightest mountain range on earth. The Sangres' string of 13,000 and 14,000 foot snow-capped peaks tower over the 7,800 foot valley below. 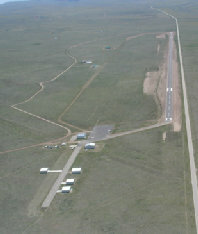 SilverWest Airport is easily approached from nearly any direction with the lowest terrain to the northwest and southeast. For those pilots approaching from the west, Mosca Pass, just 18 nm south, offers a 9,740 foot doorway through the Sangres into the beautiful Wet Mountain Valley. Airport elevation is 8,290 feet MSL and CTAF is 122.9. Our newly resurfaced runway is 54 feet wide and 7,000 feet long. 100LL fuel is available. Current price as of 1/5/2018: $4.55/GAL. Conoco-Phillips 66 credit card users get an additional 10 cent/gallon discount!